Magpie Moth: Cliff Richard led astray by sorcery! Cliff Richard led astray by sorcery! 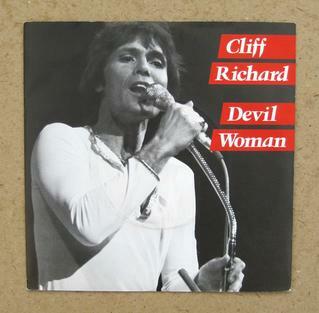 Like a bad sign hanging over me, it seems I can't carry on writing about the charts of 1976 unless I deal with Cliff Richard's Spring top ten hit Devil Woman. So let's attend to the witchy elephant in the room. Even by the 'anything goes' standards of 1976, Devil Woman is a deeply odd song to have been placed into the hands of noted Christian bachelor Cliff Richard. Now, if you're expecting any cheap shots at the expense of either category, look elsewhere. That's the least interesting thing I could write about here. But it is true that the preposterous lyric about a young man being seduced against his will by a practioner of the dark arts doesn't, on the face of it, fit with Cliff''s public persona at all. Which in turn makes the song such an object of curiosity. The fact that it's Cliff - wholesome rollerskates, mistletoe and summer holidaying Cliff - being led astray by sorcery gives Devil Woman a presumably unintentional transgressive energy, making it unlike anything else in his back catalogue. The conflation of evil and female sexuality expressed is bizarrely, wrong-headedly compelling in a way not often seen outside Dracula. Of course it helps that the song itself is a stonking piece of occult rock boogie, with the funky keys and bass in the intro being worth the price of purchase in their own right. In short, there's a whole lot of cognitive whiplash goin' on here, wrapped around a proper tune. It's very strange in the way that only really straight stuff can be. And it speaks volumes for the power of the results that the only contemporary I can think probably better suited to sing Devil Woman would be that great doom shaman Ozzy Osbourne. Don't believe me? Check out this performance, featuring some great intrepretative dance and the politest 'ugh' in rock and roll, which by Mr Richard's standards is practically gonzo. So, what does all of this say about 1976? Well, for starters and most importantly, it tells us that its tolerance for misogyny was much higher than we would accept these days. Even more so than Sailor's A Glass Of Champagne, Devil Woman's gender politics consign it to being a period piece rather than a tune for the ages. No-one today would get away with it, and quite rightly so. Culturally, it also reminds us that a lot of 1970's rock was powered by the co-option of the blues (or at least motifs from the blues) - the ethics of which is a whole other conversation - but if Cliff was doing it you can safely assume that by the middle of the decade it had become very mainstream indeed. It's also a another answer to the recurring question in these posts of whether pop was in crisis in 1976. Pop, fuelled by funk and disco, was doing surprisingly well, thank you very much. But when Cliff freakin' Richard was riffing harder than pretty much anything else in the charts short of Thin Lizzy, it's clear that rock - not pop - needed to take a long hard look at itself. What's the Welsh for noticeboard? Vorrh! (Huh!) What is it good for?